What are the "Services" groups? If you look under "Listeners" in Policy Studio, you will see the various "Services" groups. In the screenshot below we see "Default Services", "OAuth 2.0 Services" and "Sample Services". These are a way to group different paths under different ports. 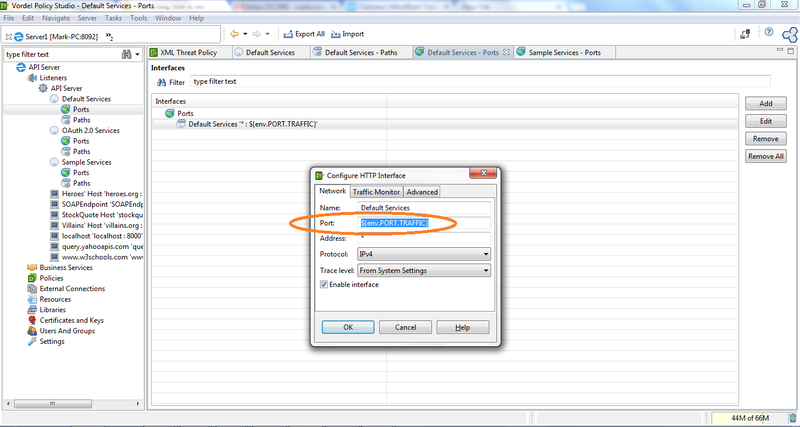 So, for example, the sample services are only available under the port which is defined under "Sample Services". And, the sample services can be disabled en masse, without affecting other listeners. You could also setup a new Services group, call it "SSL Only", then put an SSL listener in that group. 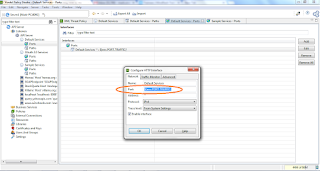 Then, paths exposed under "SSL Only" could only be accessed using SSL. If you look at the circled item in the screenshot above, you see that the port number is not visible. Instead, we see an environmentalized parameter. So where is the port number? Notice that the variable starts with "env". This is a clue. It is in the Environmental Properties file. Notice the highlighted text. This is where the port is defined, and it's port 8080 at the moment. You can change this value here. And, in fact, you can add other variables here and then reference them in policies, providing environmental customization of the API Server [e.g. on another machine, we may use 8888 instead].